The following information is a quick 'at-a-glance' compilation of just some of the useful things you may wish to know about Bramfield. You may also wish to consult the Bramfield Village Map, which gives street names and the locations of places of interest. Clerk to Bramfield Parish Council. Bus stops located along the main village street. Services to Halesworth (East Suffolk Line train station), Saxmundham and Aldeburgh. For general local travel see the 'Travel Information' section of our Useful Links. Cutlers Hill Doctors Surgery (in grounds of Patrick Stead Hospital), Bungay Road, Halesworth, Suffolk IP19 8SG. Tel: 01986 874618. Own parking. ‘Open Door Carer Support Group’, The Garden Room, Patrick Stead Hospital, Bungay Road, Halesworth, Suffolk IP19 8HP. Held on 1st and 3rd Monday every month. 1:30pm — 4:30pm. Alternate Mondays during January - September. Every four weeks on a Monday during October and November. Queen's Head, Bramfield 3:45pm - 4:05pm. Bramfield Stepping Stones Pre-School, Bridge Street, Bramfield, Halesworth, Suffolk IP19 9HZ (at Village Hall). Tel: 01986 784586 Email warwickcraig@hotmail.com. Bramfield Church of England Voluntary Controlled Primary School, Bridge Street, Bramfield, Halesworth, Suffolk IP19 9HZ. Tel: 01986 784205 Email head.bramfield.p@talk21.com. Bins for various items located at Bramfield Village Hall, Bridge Street, Bramfield, Halesworth, Suffolk IP19 9NY. 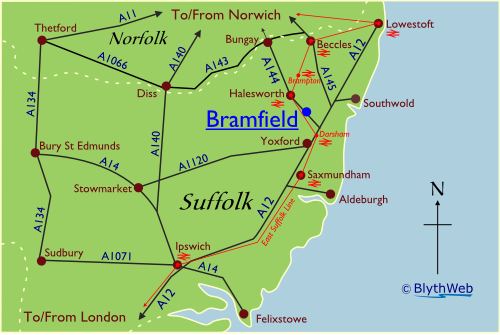 Sustrans Regional Route 42 passes through Bramfield and connects with Sustrans National Route 1 (Dover - Shetland Islands). Bramfield Village Hall, Bridge Street, Bramfield, Halesworth, Suffolk IP19 9NY. K W Clarke, Low Road, Bramfield, Halesworth, Suffolk IP19 9JQ. Tel: 01986 784244.